Megh CM Conrad Sangma inaugurating CT scan at Tura Civil Hospital on Tuesday. 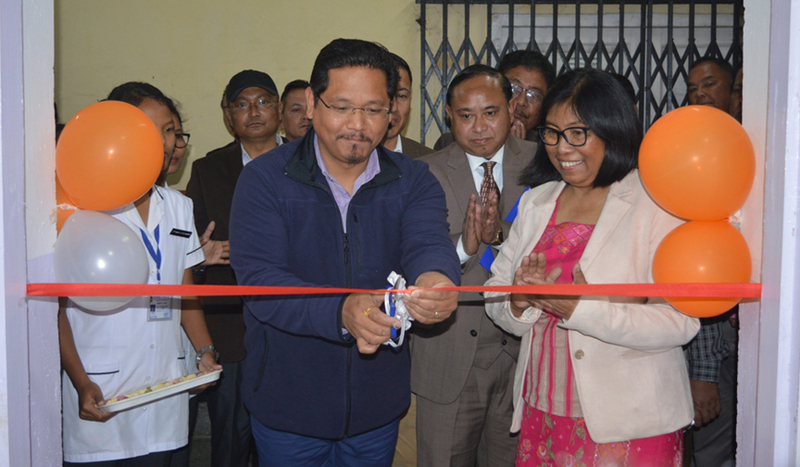 Meghalaya chief minister Conrad K Sangma on Tuesday inaugurated various health care facilities at the Tura Civil Hospital in West Garo Hills. At the Tura Civil Hospital complex, chief minister Conrad Sangma inaugurated installation of CT scan, upgradation of clinical laboratory and orthopaedic operation theatre and new eye operation theatre and ward complex. In his inaugural speech, chief minister Conrad Sangma, while highlighting the importance of social sector said health care services is the most important service and any government should provide the basic health care facilities to the people of the region and make it accessible even to the grassroot level. Stressing on the quality of service provided to the people, the CM urged the medical fraternity to know the purpose of their profession and to make a difference in people’s lives by providing the necessary services to them. Expressing his satisfaction with the new services being provided to the people, he the CM said it is unfair for the patient and their family to travel long distance just for this diagnosis and hopes that there will be change in medical care in the coming days. He also informed about the improvement of Megha Health Insurance Scheme in which the insurance cover has been increased to Rs 5 lakh from Rs 2.8 lakh and it aims to include 8 lakh families under the scheme, stated an official press communique. Further, the CM also informed that the government is working towards installation of dialysis machine in Tura which would help many patients who are not in position to travel to other places and also working aggressively for providing free basic medicine to the people in the next financial year. While delivering his keynote address, additional director of health services (MI), Meghalaya, Dr A War stated that these new facilities available now in the Tura Civil Hospital has been a tremendous stride for the government and is also a gift for the people of the Garo Hills region, who no longer would need to travel to Guwahati or Goalpara just to do the CT scan. Further, Dr War informed that Rs 3.25 crore has been sanctioned for the installation of CT scan for the financial year 2017- 2018 and added that it would be made operational soon after installation and a person has already been sent for training to operate the machine. Moreover, Rs 4.95 crore has been sanctioned for upgradation of clinical laboratory which provides pathology, microbiology, haematology with complete power backup. He also mentioned that the Blindness Control Society has provided Rs 75 lakh for the new eye operation theatre and eye ward for the benefit of eye patients and the equipment provided would be augmented by the District Blindness Control Society, Tura. West Garo Hills Deputy Commissioner Ram Singh; Superintendent of Tura Civil Hospital Dr Menakshi A Sangma were also present at the programme besides others.